NOW: Recently Jean Sherrard scaled the Great Northern tower and photographed in every direction, including this one northeast towards the “former” location of St. James Cathedral. Of course it is still there although when searched for from the depot’s tower it is now hiding behind the recently raised Skyline Retirement Community, one block south of the cathedral, also on 9th Avenue. Call it the spiritual urge to approach heaven or public relations; the Roman Catholic Church has had a historic knack for putting their parish footprints on tops of hills or on horizons. 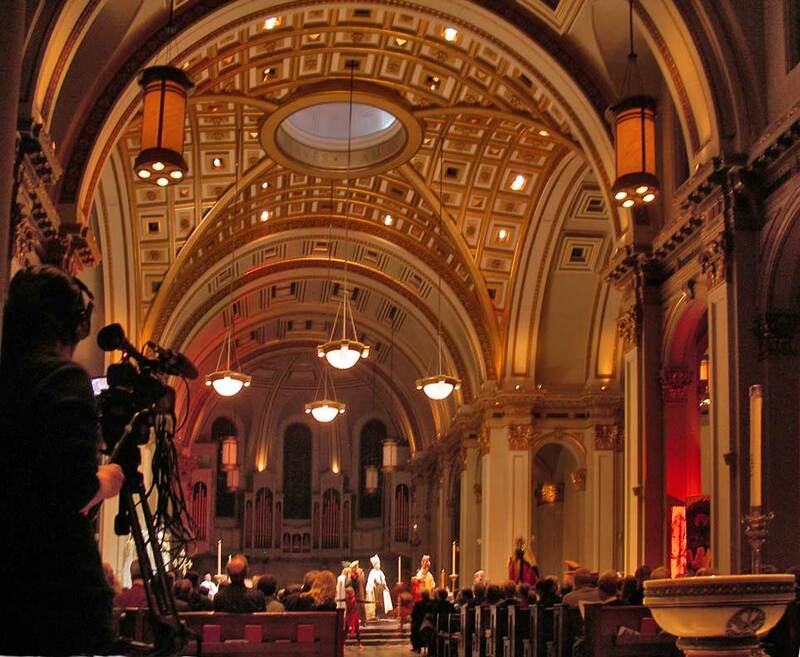 St. James Cathedral is Seattle’s best example of a landmark sanctuary. 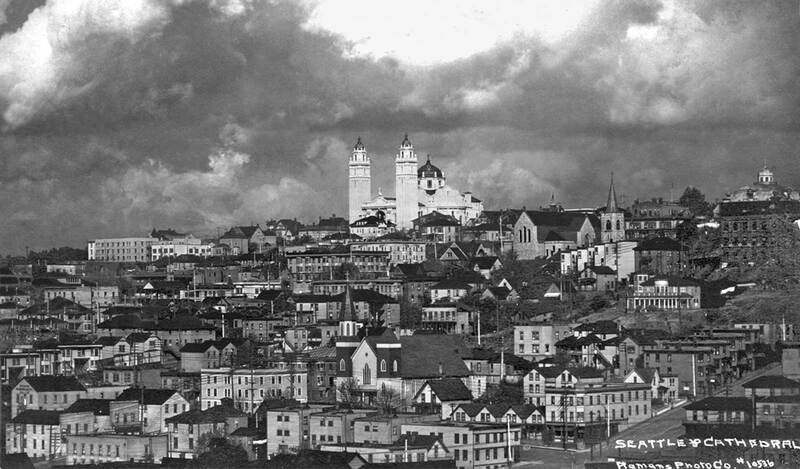 Dedicated late in 1907, it’s twin towers, cupola and reflecting skin lent a plush interruption to the First Hill skyline and for years St. James watched over the city, and the city look up at its good shepherd. 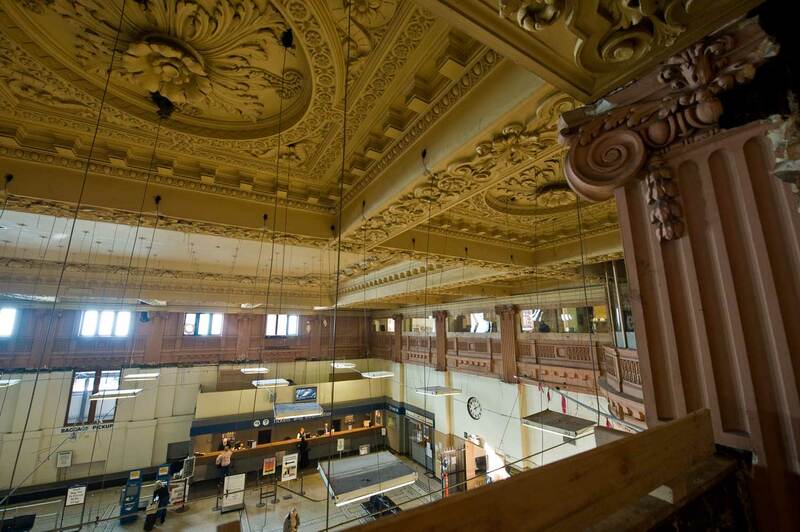 Most likely within the first year after the cathedral was topped-off the commercial photographer William Romans left his studio on the sixth floor of the Colman Building and headed for the nearly new Great Northern Depot on King Street. The depot with its Venetian tower first opened in the spring of 1906. Perhaps Romans noted the dynamic sky beginning to brew over the city and decided its chiaroscuro delights would make an exquisite backdrop for the gleaming St. James, and it does. 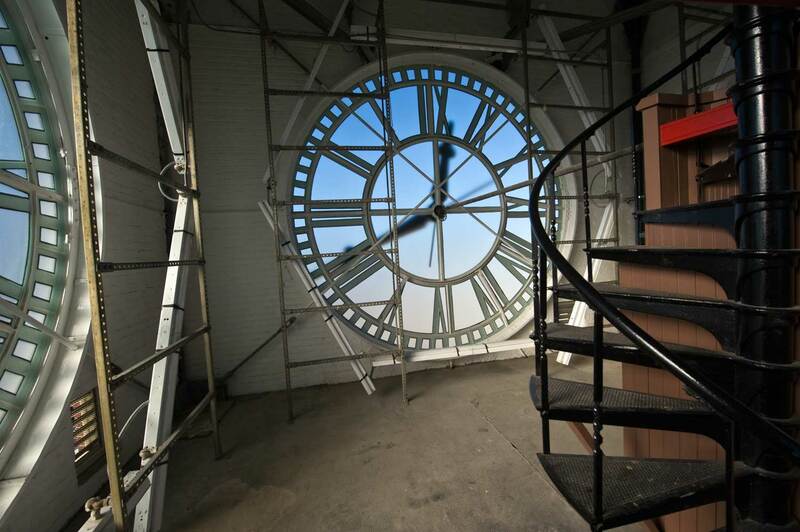 One cannot reach the top of the depots’ tall campanile by elevator but rather, as both William Romans and Jean Sherrard discovered, by an exposed stairway. Given the effort it is perhaps not surprising that so few photographs taken from the vertiginous tower survive. This side of St. James, very little survives from the hill-climbing field of mostly flats for workers – many of them single women – who once walked to their jobs in the Central Business District. We will note one abiding five story brick: the Madison Apartments facing its namesake street one block north of the Cathedral on 9th. Its rougher alleyway façade appears on the left horizon to the right of a First Hill grove of leafy street trees. 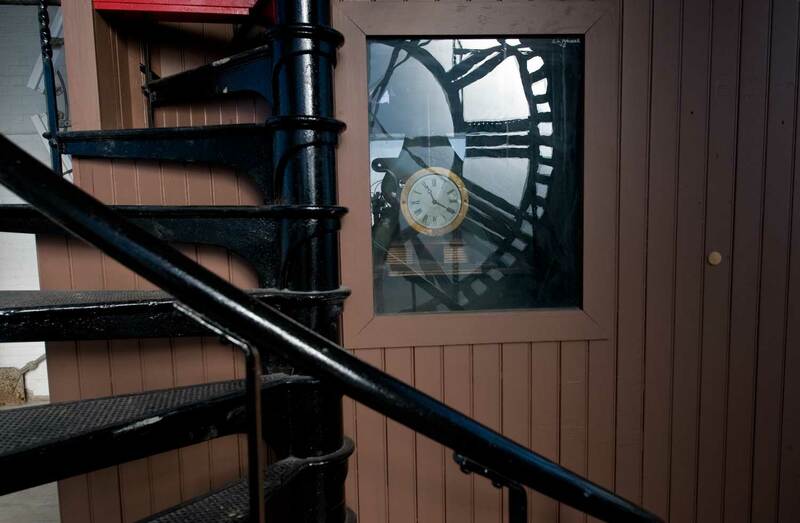 Then we climbed up the tower, passing through the clock room before ascending to the observation deck. 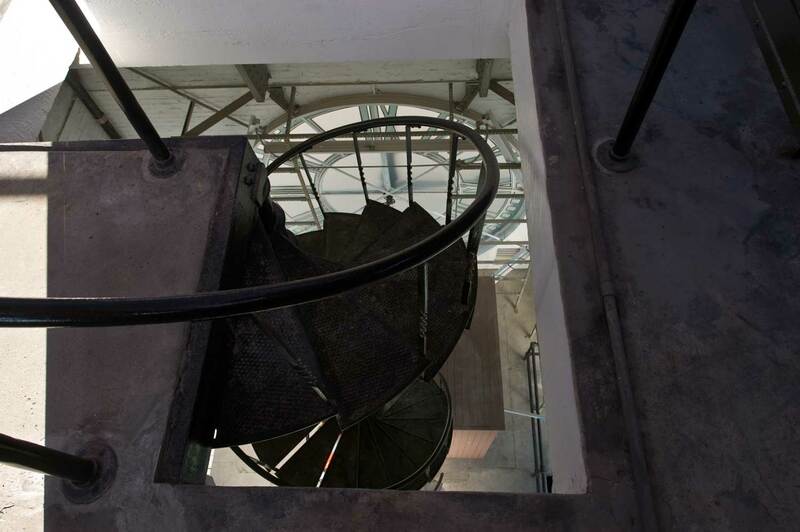 Finally, we clambered up the cast iron circular steps to the observation level. 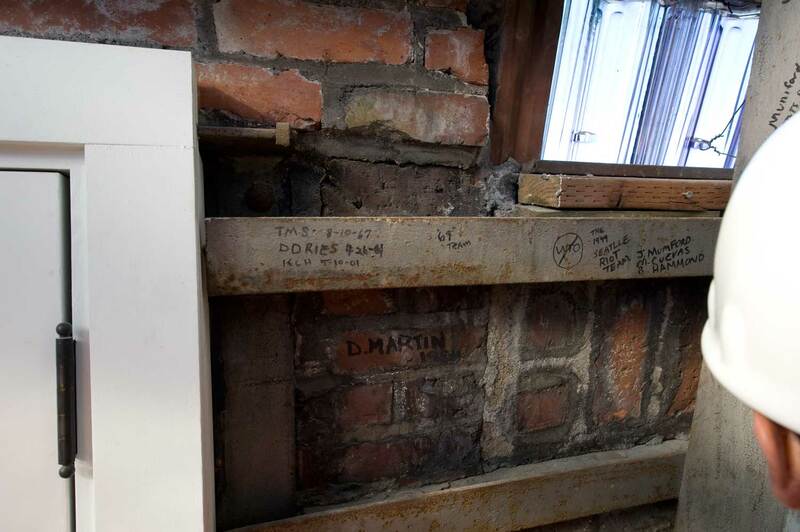 The first thumbnail looks back down the stairs; the second contains a graffiti record of past visitors. Note the hanging fluorescent lights, which illuminate the glass pyramid at night. First Jean, oh that we might have a telescopic look at that pyramid at night, now that we know the mystery of its glowing. 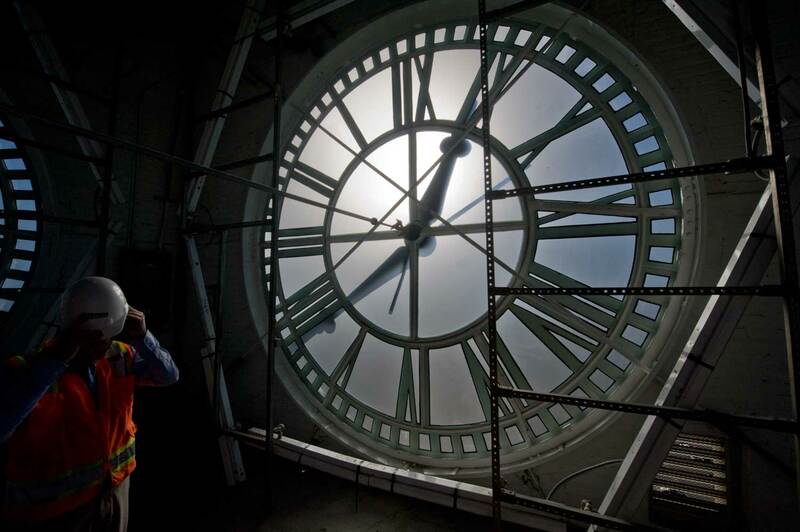 A quarter-century ago Genevieve McCoy climbed that tower when it was still infested with pigeons. She took black-white looks to the east, over the International Districts (all its parts) for a now-then that was concerned more with the Jackson Street Regrade of 1907-1909. We might have brought that story back as one of the additions except, as you know, you and I are somewhat preoccupied with getting our & Berangere’s show on Repeat Photography together for the Museum of History and Industry (MOHAI), which show will open – again as you Jean well know – on April 9th, a Saturday. We may hope that our readers will mark it on their calendars or forearms. Now the “extras” that we will give are just a small part of what we might have given were it not for the earnest call of this April (and beyond) exhibition. The museum needs some time to mount and hang our selections and we still have the captioning to do. So here follows two past features – only – both having to do with St. James Cathedral, and somewhat repetitive they are too. Both deal with the crushing of the sanctuary’s dome under the wet accumulation of the 1916 Big Snow. Following the two features we will attach like fox tails to a motorcar’s antenna a few things more. On the left, the St. James congregation leaves its sanctuary at 9th and Marion after celebrating it's 1907 dedication. On the right is the first of several interiors, this one looking east towards the chancel. 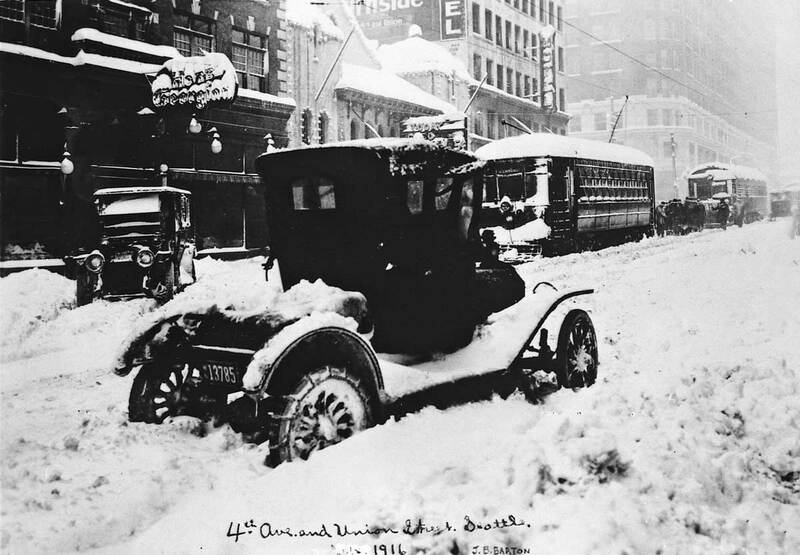 The next day the Times reported that it had snowed for 27 hours without interruption. This pile up marked the end of the popular slipping on Green Lake and the beginning of it everywhere else. In response, the Humane Society called for the sharp shodding of horses to prevent their falling. It also announced a general “feed-the-birds plea.” And the Time’s forecaster confidently predicted more snow. He was extremely correct. The Wednesday afternoon final weather check found “the greatest fall on record for any similar period” – almost three feet in two days. This made for the kind of sensational weather that was a relief from the “partly-this-and-partly-that” hedging of meteorologists on Puget Sound. 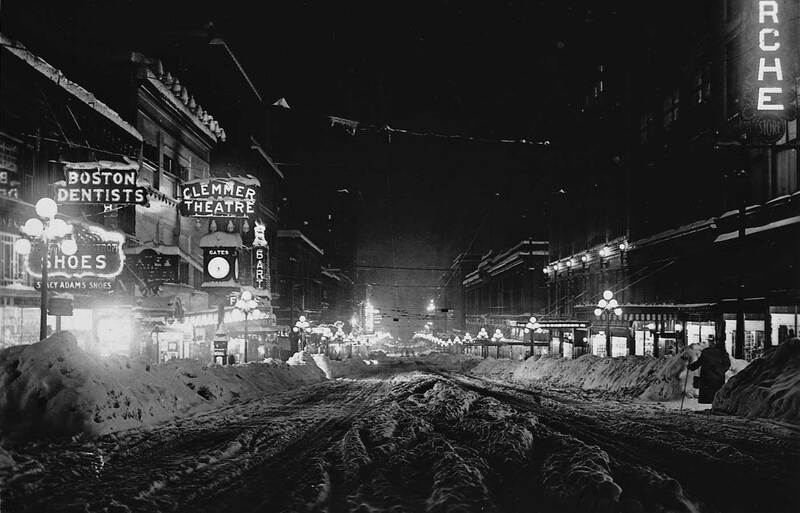 The schools were closed, street cars stuck, and connections with the suburbs abandoned. Captured by the snow, a car near 4th and Union is abandoned for the duration. This “Big Snow” was the big news of the day. The Wednesday Times banner headline read “More Snow Predicted.” The news included the collapse of the roof of the West Seattle Christian Church. That was at 1:30 in the afternoon, about 103 minutes before the cave-in of another Christian canopy. This second fall was the blizzard’s most spectacular effect. St. James looking north on 9th sometime before the congregation's cupola crumble. Thirteen years earlier, in 1903, Bishop O’Dea moved his diocese from Vancouver to Seattle. 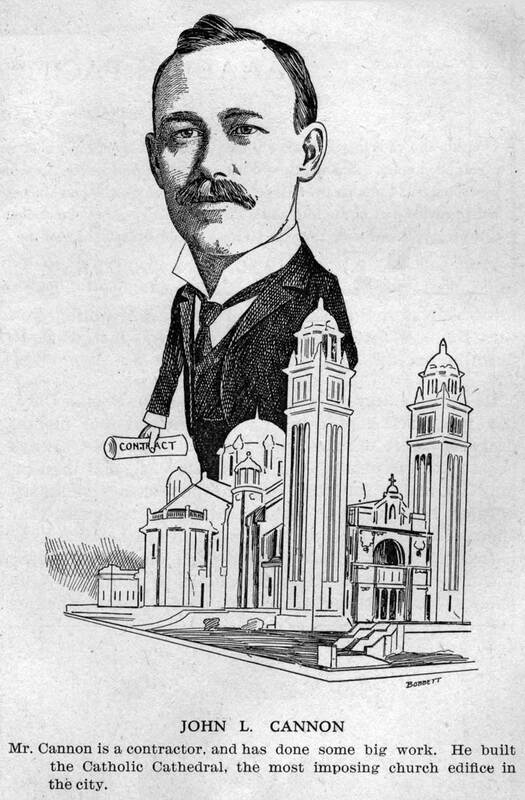 With a leap of faith and a promoter’s talent for raising money, the bishop built the grandest cathedral in the Northwest and dedicated it on December 22, 1907. 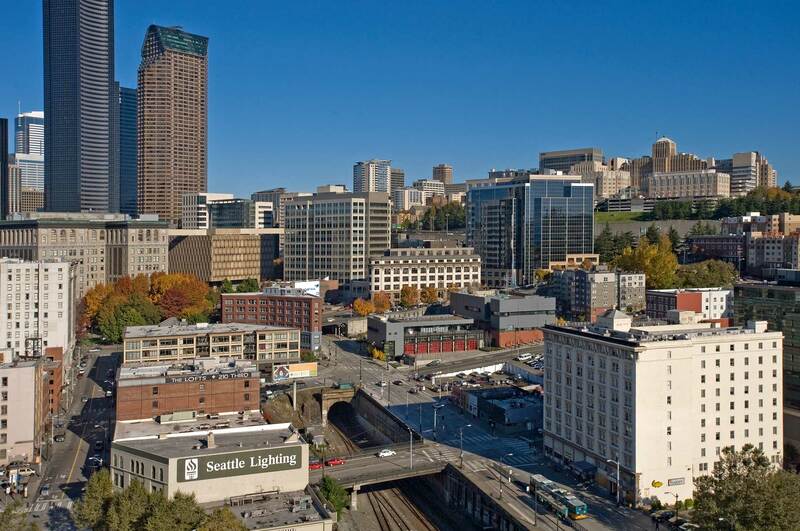 Its twin 175-foot towers and octagonal dome, topped by an electric cross, dominated the city’s skyline from First Hill. 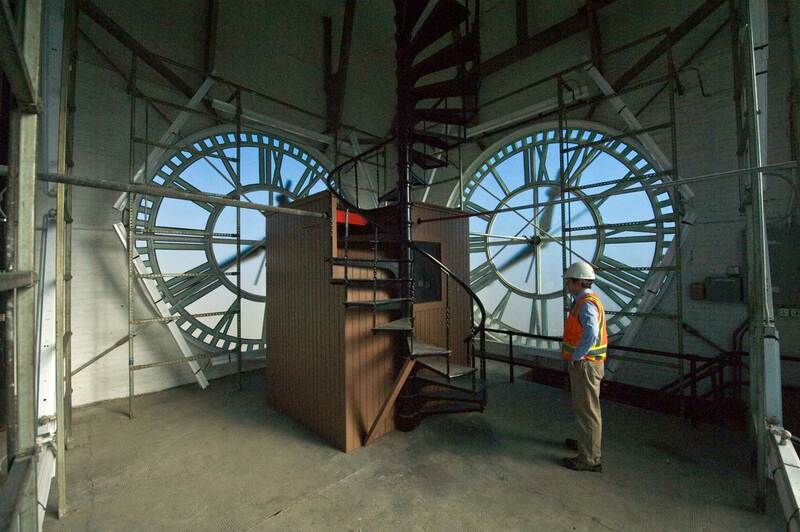 Covered with copper, the dome was supported by four steel trusses of which the south one had an undiscovered flaw. 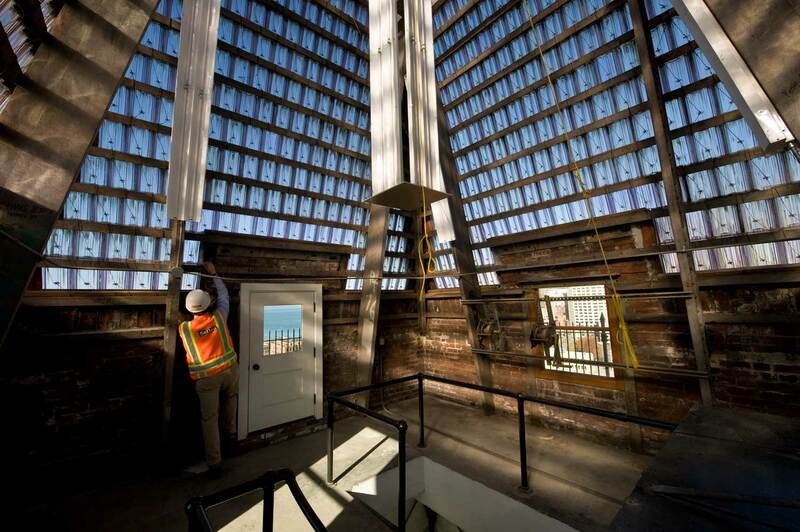 With the estimated added weight of 30,000 pounds of wet snow, it buckled, neatly folding the whole dome 120 feet to the sanctuary’s mosaic floor. 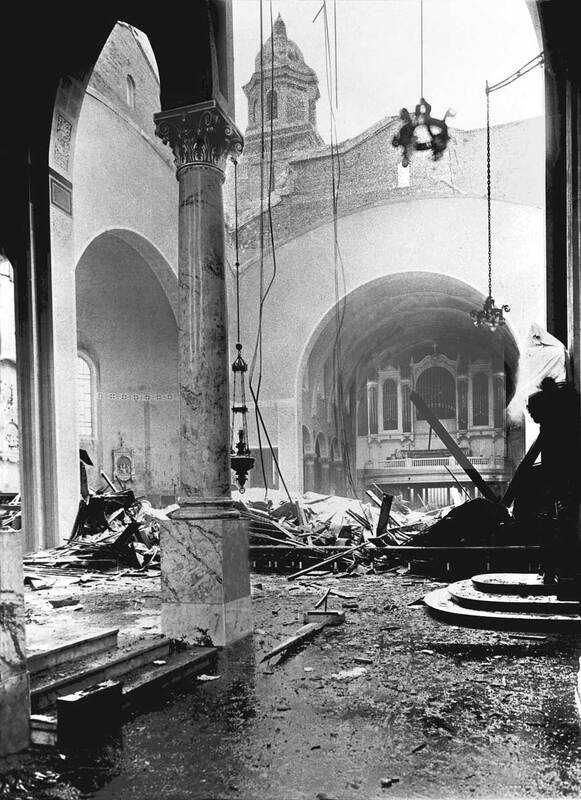 Air pressure popped most of the cathedral’s windows, and the pulpit and altar rail were crushed. The bishop, offering an ironic prayer, “thanked God” that no one was worshiping in the cathedral at 3: 13 that Wednesday afternoon. Saint James sans dome. Photo by Price Studio. 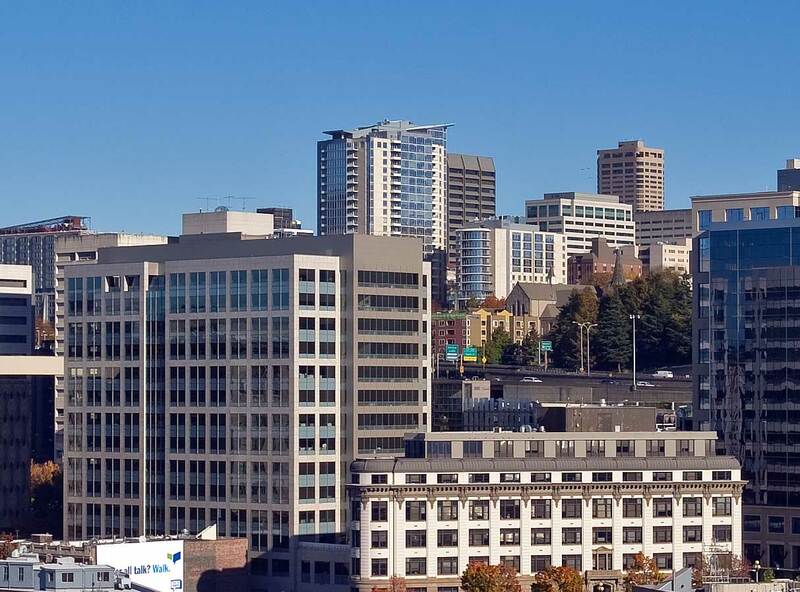 On Saturday Seattle got its first mail from the east in five days. On Sunday, 19 snow-stalled trains reached the city. By Monday all the streetcars were again running on schedule; but on Tuesday the week of the Big Snow was followed by one of avalanches. The softened and exposed ridges along Sunset Hill, Magnolia, Queen Anne, and West Seattle began to slip in places, taking a dozen homes and two lives. 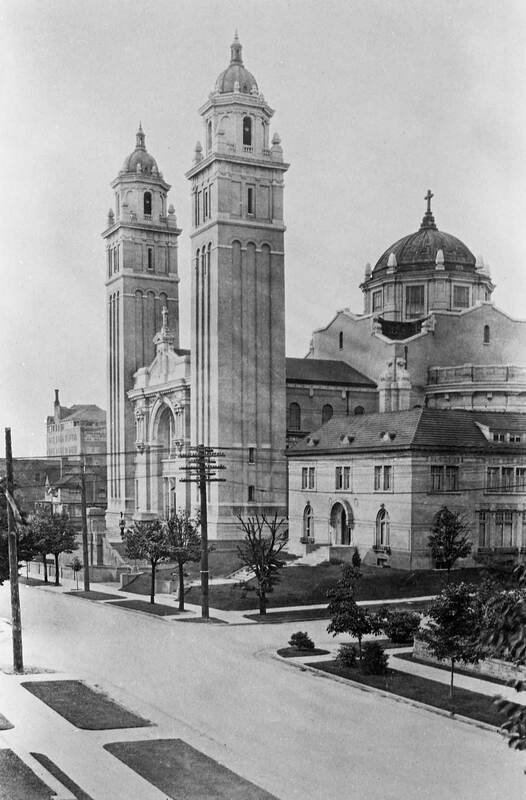 When the St. James Cathedral reopened for worship March 18, 1917, it was without a dome. 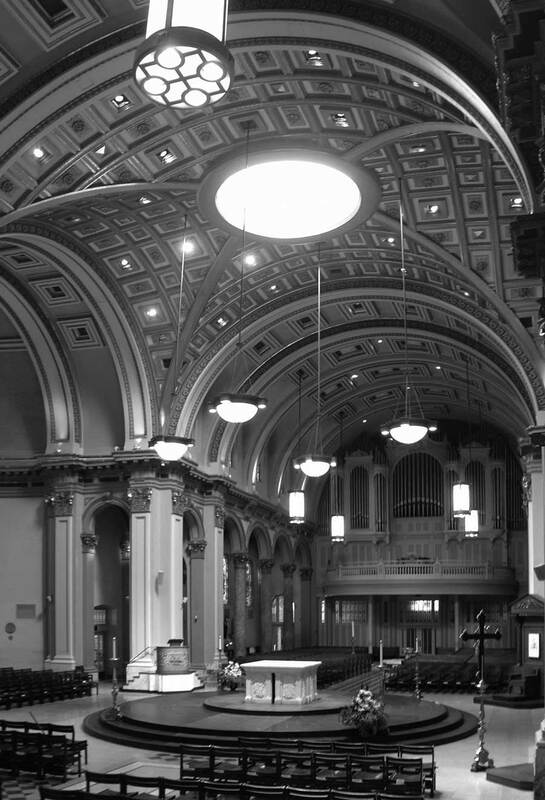 Although the sanctuary was less “mighty,” it was more’ ‘inspiring,” for the poor acoustics of the cathedral had been improved with the new cover. With this alteration, Gregorian chants and Latin oratories could stir the worshippers in any weather without the threat of the roof falling in. 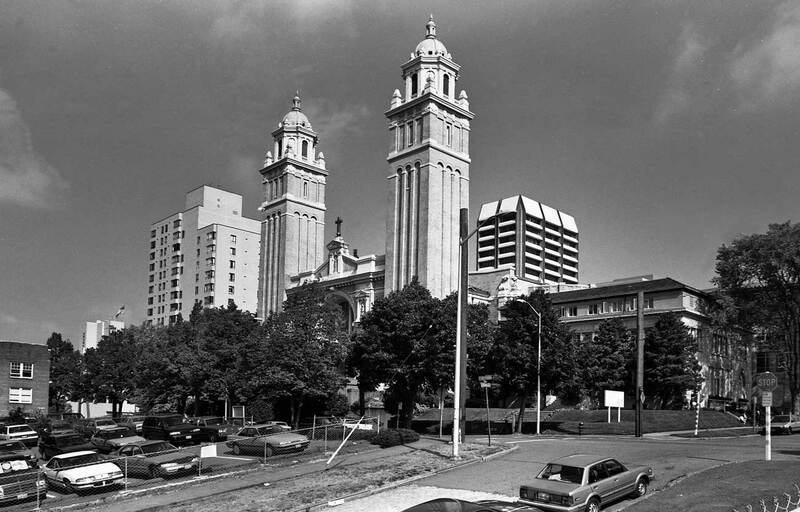 Years ago - perhaps 1995 - while photographing St. James for a book, I noticed that at least from the parking lot at the southwest corner of 9th Ave. and Columbia Street, the sanctuary had managed to replace its lost dome by making a lantern out of the Cabrini highrise on the west side of Boren Avenue south of Madison. 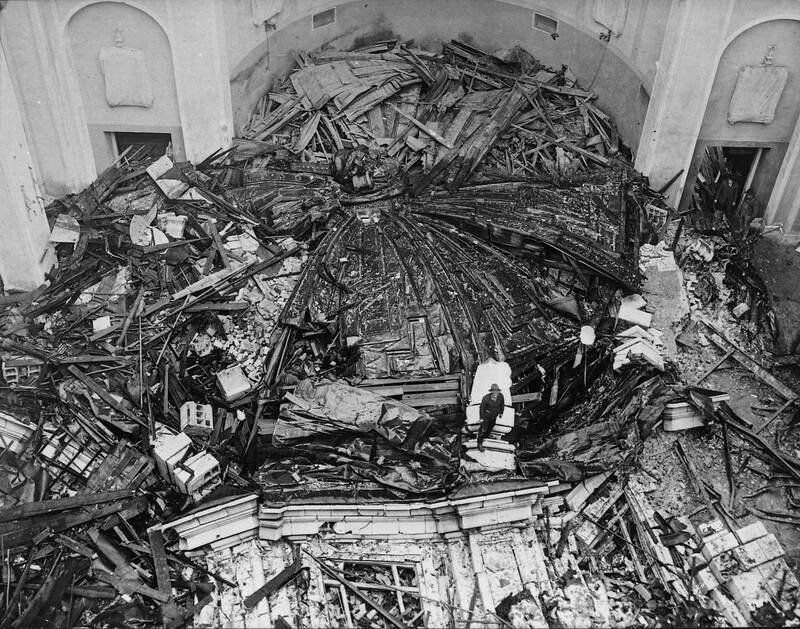 At 3:15 on the afternoon of February 2, the skylight dome of St. James Cathedral neatly folded like a house of cards and carrying the cross behind it fell to the transept floor 120 feet below. It was the most spectacular collapse of the several local roofs that were crushed under the wet snow dumped during the historic blizzard of the winter of 1916. In the accompanying photo most of the ruins are hidden beyond and below the partially crushed altar rail that crosses the scene from the right just beyond the steps to the bishop’s chair. The sancturary was then still elevated four feet above the nave, and the high altar sheltered below its baldachin – a canopy supported by four ornate columns one of which shows in the foreground of the historical view. The repaired cathedral was built at one level and the altar set directly below the “oculus Dei.” This “eye of God” first returned unfiltered light to the sanctuary a part of the cathedral’s most recent restoration in 1994. The repeat, like the look thru the ruins, has its back to the chancel. Here the balcony with its organ is the distant subject. It stands above the church narthex at the front door. The best way to compare the original sanctuary with its present setting is to examine the part that has changed the least — the nave that is capped at its western end with an organ that when it was installed was considered by many as “the best in the west.” Because of the length of the cathedral and the accompanying acoustic delay a second organ was installed at its eastern end, and the two can be played from one keyboard. The contractor Cannon - not the architect - as he was characterized in an early 20th century vanity mug book. Then and Now Captions Together. Since its dome collapsed under the “Big Snow” of 1916 because of a flaw in its construction, St. James Cathedral has gone through four renovations and/or restorations, the most recent in 1994. 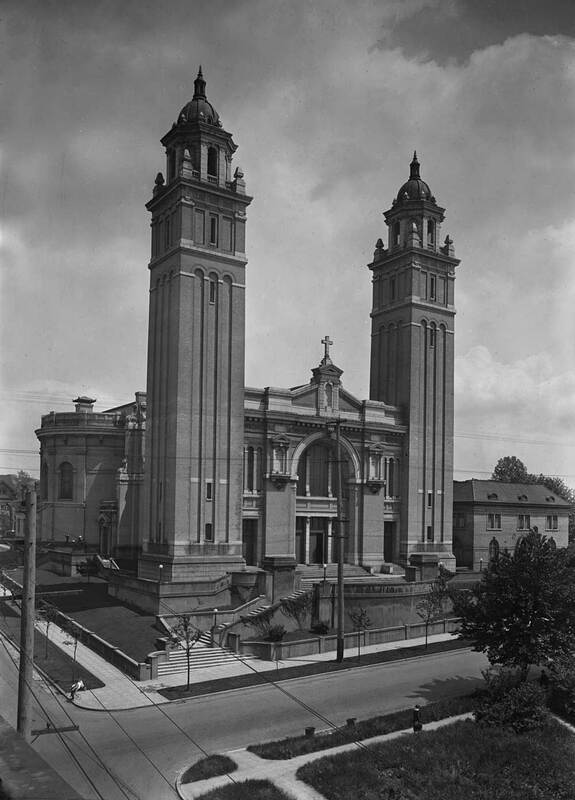 Built in 1907 the cathedral is fast approaching its centennial. 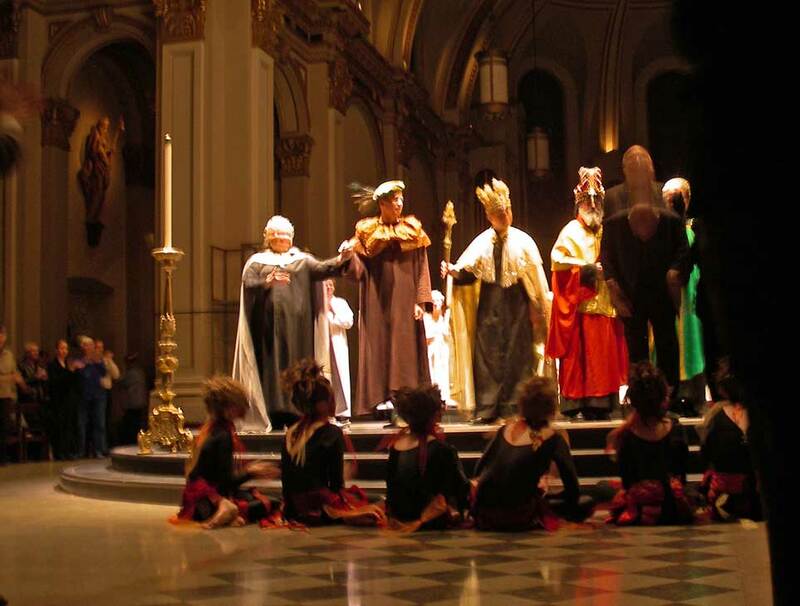 Here is St. James showing its 1994 remodel on Nov. 17, 2007, the year of its centennial, and a Thursday night for the performance of an allegorical opera - with dancers. I attended with delightful event with Sheila Farr, then the Times art critic. I cannot. She had seasons tickets to the Early Music Guild. Here they are performing Rappresentatione di Anima et di Corpo by Emilio de' Cavalieri. This, according the liner notes, was first performed in Rome in 1600 and is one of the earliest examples of musical drama. It is the story you will be familiar with - the struggle of the Body and Soul in their choice between lasting peace and happiness in heaven (or alternately lasting peace in death), and early pleasures in this life. It is a tough choice. Part of the cast receives its applause. 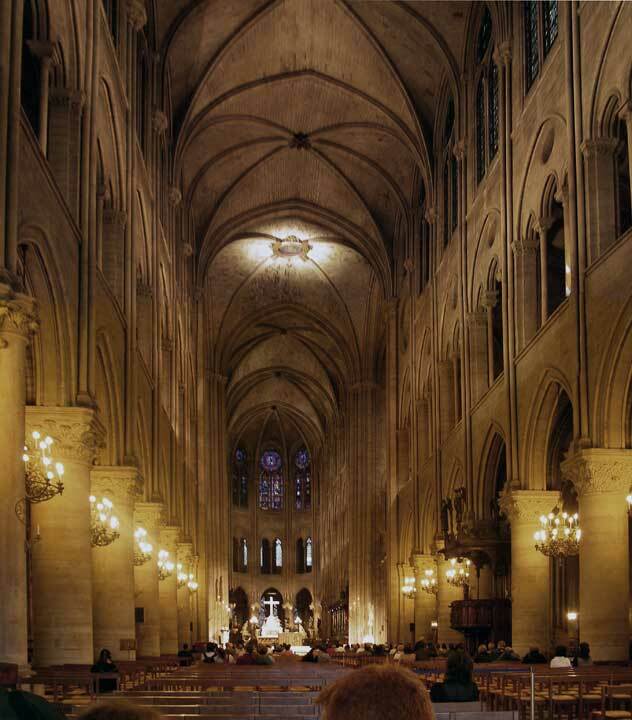 For comparison, here is the interior of Notre Dame in Paris, France. I propped by camera on the back of a pew for a long shutter recording of the nave and high above the transcept the church's own spotlighted "eye of god." I recorded this on the last day of Jean and my 2005 visit with Berangere and her family in Paris. 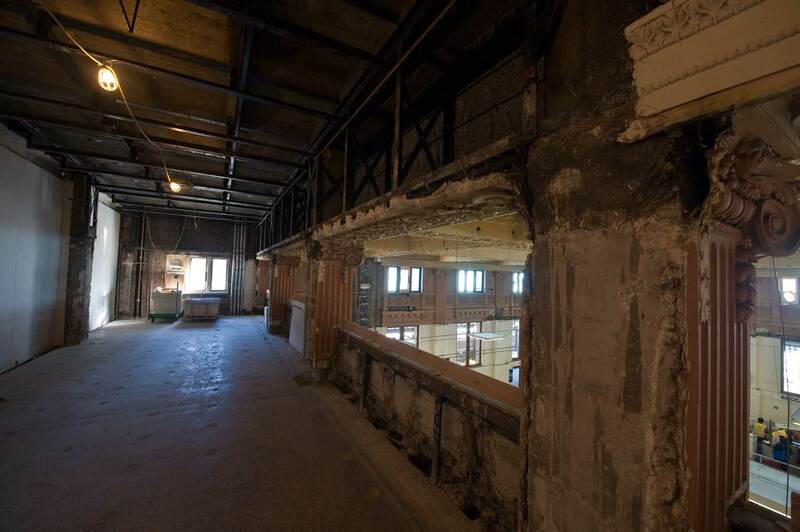 It is wonderful to see what St. James looked like from the start. While the dome was part of its initial beauty, the recent restoration makes the edifice an architectural point of interest.